One of the reasons people like summer camping is the feeling of being in the great outdoors, plus it gives them a chance to take off in their 4×4. But even if you love being outside, it’s nice to have a covering overhead or on the sides of your 4×4 to block out either the sun or rain or even wind—and that’s where 4×4 awnings or rooftop tents come in handy. A happy medium, if you will. So if you want to add an awning to your camping gear, how do you decide which one is the best? Well, that’s where we come in because we sorted through the choices for you. Here are five recommended 4×4 awnings and rooftop tents, from the practical to the luxurious. This simple 4×4 shade awning is perfect for those who just do the occasional weekend camping holiday. At $99, this awning fits most any budget and provides shade off the back of your SUV. (Great for those of you that camp with tents rather than a caravan!) The 2.4 x 2.4 metre cover makes this awning a good choice for a couple. The sturdy aluminum and steel pole system will make sure it stays put, and it comes with a carrying case. This 4×4 awning really isn’t just an awning—it’s so much more. This gives you a rooftop tent and a place to get away from the elements, including a mesh door and windows to provide a breeze. It sets up quickly off the side of your 4WD and comes with a ladder to climb up to your sleeping quarters. And the bonus of a rooftop tent is that it allows you to get away from nocturnal creatures and keep you dry in the case of heavy rains. The durable fabric also provides a waterproof environment, and each mesh opening also features flaps to cover it. While it may cost $950, the Adventure Kings Roof Top Tent combines tent and awning so you can justify the price. If you head to the Ironman 4X4 site, you can use the tool to select the type of car you own so you can pick the perfect awning for your car. This excellent feature allows you to easily narrow down your options while still getting all the best features of an Ironman 4×4 awning. These include waterproof, breathable rip stop material, 100 percent UV protection, mould resistant and self-standing aluminium legs. They all mount easily to most roof bars or racks, and they also are easy to set up and retract. Prices range from $250 to $1,000 depending on the type of Ironman 4×4 awning you pick from just a roof to an annex with walls. If you’re camping with a family or a group of friends, then the Foxwing Awning may be worth the investment. This unique awning shades not only the back of your car but also the sides, protecting a larger area from the sun or rain. This 4×4 awning, the result of collaboration between OzTent Australia and Rhino Rack, is a one-piece, easily assembled camping accessory. The rip stop, polycotton canvas material provides UV protection and is waterproof. It has a 2.4 metre radius and packs down easily for transportation. The awning easily connects with accessories such as the OzTent RV-5 and others or the Foxwing accessories to give you extra protection from the elements. Foxwing retails for $799. This Tough awning, which comes off the side of your car, provides lots of coverage for your campsite. It is considered the longest 4×4 side awning available, giving you 3 metres of coverage away from the car. As an added bonus this Tough awning includes a 2 metre LED strip light and lighter plug to allow you to use the awning at night. Ropes and pegs are included for windy times, but if not windy, then you can just use the aluminium poles and legs. These 4×4 awnings are easy to mount to your roof rack and come with all the necessary supplies to do so, plus once installed it only takes about 30 seconds to deploy. Costs $309. Now that you’ve got your new awning, bring it along with your other camping gear and visit Broken Head Holiday Park. Here you can experience the Byron Bay area on a budget when you book one of Broken Head’s powered or non-powered campsites. 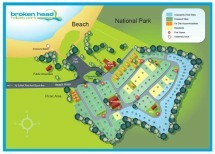 With summer almost upon us, now is the time to book your Byron Bay camping holiday at Broken Head Holiday Park. I got a tent but no car. How can I rent a non-powered site in Bryon Bay?